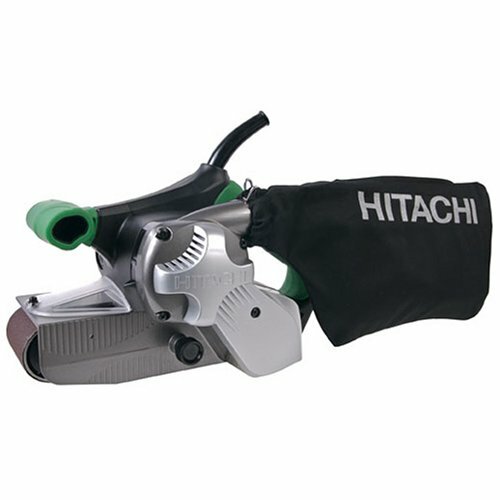 The Hitachi SB8V2 is a powerful yet lightweight sander. Easy to handle, it still has all the oomph you need to tackle those larger, more heavy-duty projects. With its quiet operation, the Hitachi is also the ideal sander for those living in apartments, who want to remain on good terms with their neighbors! The SB8V2 can handle wood and metal, and makes short work of even multi-layered paint, as well as rust. Ideal for the hobbyist or home-improvement enthusiast, the Hitachi offers the power and versatility for a broad range of uses. While it may be a little pricey to just toss in the tool box in case it's needed, those who know they'll use a sander won't be disappointed. If you're a very casual user, maybe a cheaper sander is more for you. If you do a lot of woodworking, however, the Hitachi will definitely meet your needs. The SB8V2 comes with a unique tracking window, so you can see exactly what the sander belt is doing, and adjust it before it starts causing problems with your work rate. Featuring soft-grip handles that reduce vibration, the Hitachi is comfortable to use even over long periods. For the home-improvement or woodworking enthusiast, the Hitachi is a good buy, and will serve you well as an all-day, every day workhorse. Those who do a lot of floor sanding, however, may prefer to spend their money on a sander that features auto-tracking, to avoid having to stop and adjust the belt regularly.